This May, Fathom Consulting celebrates 20 years in business. In addition to happenings planned throughout the year (looking at you staff, clients, partners, and alumni), this is the first post in a series to celebrate the last two decades and the years to come. At the top of my list of things to celebrate? Our consultants—modern-day renaissance professionals who move our clients from complexity to confidence. From our start as Evantage Consulting in 1999, the most important ingredient in our recipe for success has been our smart, creative, low-ego, and collaborative team. Anyone who has spent time with us knows we’re constantly striving to push the bar higher in all that we do—from client projects, to the perfect team building event, to fine-tuning the mechanics of a well-constructed team. For many years, we hired largely on instinct. While that served us well – our average employee tenure is over 7.5 years – we recognized it was time to mature our process. With nearly half the company weighing in at some point, we dove deep into giving our hiring process an overhaul. As we started to use the new process, we found it to do just what we hoped for: enable our team and candidates alike to have a realistic mutual understanding of one another before taking the next step. With a small, high-performing team like ours, we know this deeper level of knowledge from both parties is essential to ultimate success. At Fathom, leadership means having at least 10 years of experience. It means consultants feel at home in a self-directed environment. It means team members thrive on solving problems creatively with actionable solutions that really work. And it means people leading the charge without ego getting in the way. By definition, “hybrid” refers to combining two different elements in a mixture. Bringing a mix of experiences to the table enables consultants at Fathom to appreciate the variety of perspectives that often arise in client work. 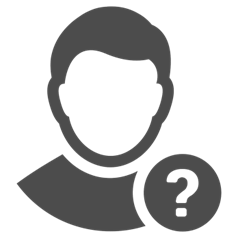 For example, team members have backgrounds that might include roles inside an organization and at an agency, or experience in marketing and information technology. Changing things for the better—for our team, our clients, or our community—requires consultants to have a desire for absorbing and producing new ideas. To foster meaningful and lasting change, all team members are encouraged to investigate new things, and share these passions and interests with the rest of the group. Understanding how to connect with people is critical for team members. “Nerds with solid social skills” is something we consistently joke about, yet it’s really true. Consultants aren’t afraid to go deep and get geeky, and are able to communicate these passions effectively. Once we identify the desired traits are a match, we consider fit with not only current clients and projects, but also with where we see market and client trends heading. Finding the next great addition to our team takes time and it shouldn’t be rushed. Our updated hiring process makes it a priority to set expectations (for ourselves and candidates) that determining mutual fit takes some time—and that’s OK.
For me, one of the joys of working with a team with this collection of traits is that we are always evolving and pushing upward – as individuals and as a team. We always encourage one another to evolve and improve. During my time at Fathom, I’ve been shaped and inspired by my respected colleagues. As consultants, people are the tools of our trade, and I know that finding talented humans that are the right match for our team is essential for success as I look toward the next 20 years. This time of year is natural for reflection, taking stock of the past and establishing goals and making plans for the future. It’s a perfect time to set your intention for the year ahead. When managing change—in your organization or your personal life—reflection represents an opportunity to assign meaning to the successes and missteps of the past year, enabling you to become more resilient and steadier as you embark on a new one. Taking time to reflect is one of the most important things I do as a leader. Whether I’m looking to make big changes in the coming year or just thinking about how I want to approach this year’s team building event, clearing the time and space to really listen to myself helps me to create clarity and enables new connections that allow me to be an effective leader. What are your unique strengths and how will you build on those? As a believer in an appreciative, strengths-based approach to life, I know there is great value in understanding and building on your own strengths (and those of your team), rather than focusing on gaps. Take the time to “inventory” your personal and your organizational strengths and think about how you can amplify those to benefit your leadership style and your business’ bottom line. What problems do you really need to solve in the year ahead? Or even the next few months? Too often I see people focused on what outcomes they must deliver or what projects they have to get done. I’m asking a bigger question. Whether you have challenges with personnel, customer service, organizational development or something else, prioritize the difficulties that, if left unchecked, will have the biggest negative impact on your business. What would need to be true to solve those problems? This question enables expansive thinking. Business rarely conforms to the ideal, which makes plotting a problem-solving course even more difficult. Consider how your organization, in the most ideal circumstances, will mitigate challenges in the new year. Will solving problems require a more connected and engaged team? A new approach to marketing? Letting go of something you’ve “always done”? Then, how will you as a leader implement the changes needed to solve the challenges ahead? Self-reflection is not just an exercise for your business; it’s like scheduled maintenance for your leadership ability. With the fast-paced speed of life and work, it takes planning and diligence to ensure you are making the time to do it. The goal of reflection is not about generating a to-do list what you will do next—it’s about creating time and space, thinking deeply, and clarifying how you will approach the future with an open mind and a mental roadmap for navigating personal and professional pitfalls. Are you ready? We are thrilled to announce that Meredith Fisher, MHA, has joined Fathom Consulting as a senior consultant specializing in strategic execution and operations. Meredith has more than a decade of experience leading organizational change, with an approach that is deeply rooted in Lean thinking and enriched by the principles of human-centered design. She brings a passion for improving the experience of work for people in all settings. Meredith joins Fathom from Allina Health, Abbott Northwestern Hospital, where she served as Senior Performance Improvement Advisor— partnering with leaders on initiatives such as process and workflow improvement, prioritization, and redesign of a strategic planning system. With Allina, and in other roles at the University of Minnesota and Hennepin Health, Meredith has focused her career on helping others drive change and increase organizational effectiveness. Meredith holds a Bachelor’s degree in Journalism and Strategic Communications from the University of Minnesota, as well as a Master’s degree in Healthcare Administration from the University of Minnesota School of Public Health. Learn more about Meredith on LinkedIn and join us in welcoming her to the Fathom Consulting team! 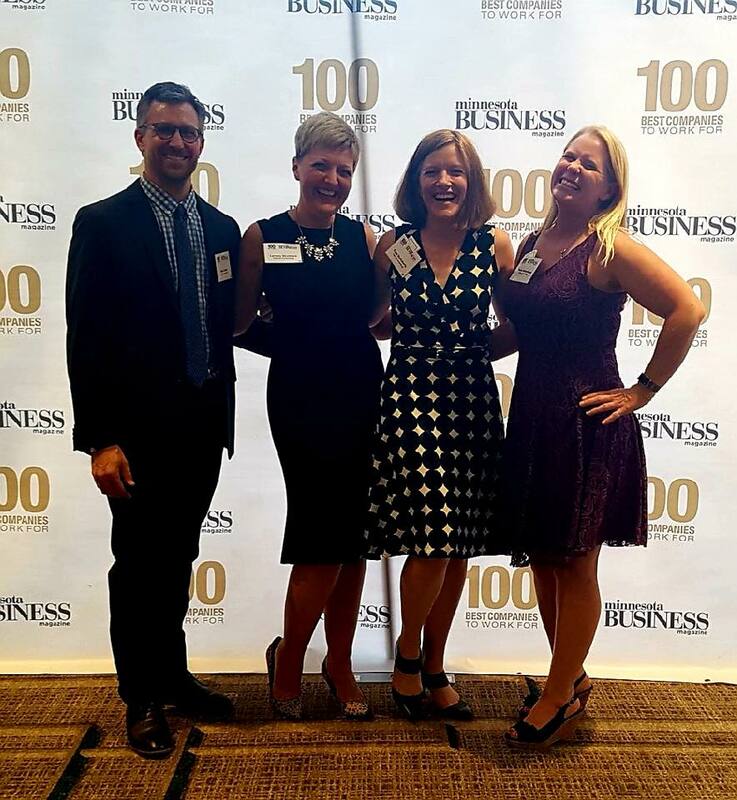 Our founder, Robin Carpenter, dedicated her career to mentoring young professionals and empowering everyone in the Twin Cities digital marketing community to do better. As a founding member of the Minnesota Interactive Marketing Association (MIMA)—the longest-standing digital marketing association in the country—Robin felt strongly that education and collaboration would aid the Twin Cities in developing talented digital professionals. It is only fitting, then, that MIMA honors Robin’s legacy—and that of her contemporary, Jarrid Grams—with its annual MIMA scholarship, funded through contributions from Fathom Consulting. This year, the Carpenter family has underwritten one of three scholarships, a testament to how much her family believes in the work Robin began so many years ago. The Jarrid Grams and Robin Carpenter Memorial Scholarship is available to undergraduate or graduate students pursuing careers in marketing, technology, communications, and math. To apply for this year’s scholarship, each student was asked to create a marketing plan for a fictitious company, incorporating budget, creative concepts, strategy, positioning, and digital executions. As a long-time member and former president of MIMA—and close friends with both Robin and Jarrid—I have been privileged to serve on the committee that evaluates the student nominations and selects the recipients. I was blown away by this year’s student entrants, who demonstrated inventiveness, strategy, and vision beyond their years. 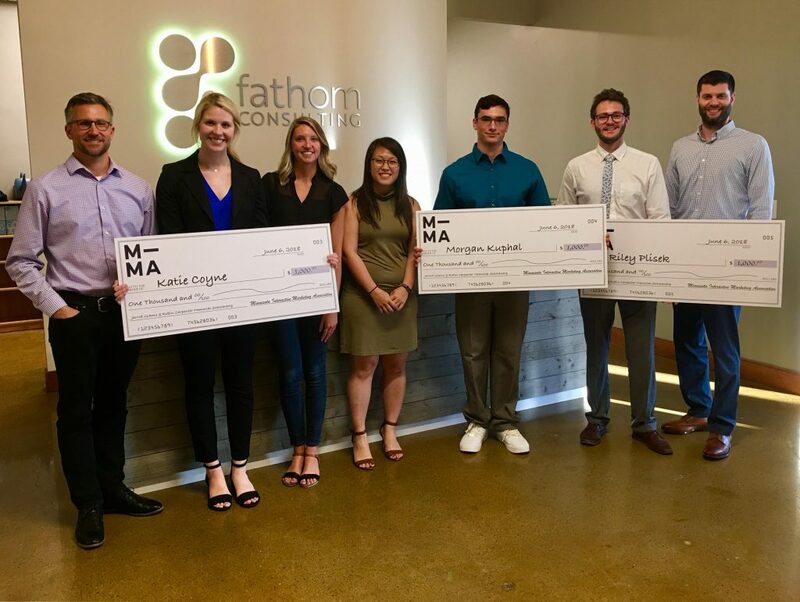 Nothing makes me prouder than awarding these scholarships to our 2018 MIMA Scholars: Katie Coyne, Morgan Kuphal and Riley Plisek—right here at Fathom Consulting on June 6. When I first got involved with MIMA, the Twin Cities was not recognized as a hotbed for digital marketing. Long considered “flyover country” by Silicon Valley, the digital marketing community was relatively disconnected. Thanks to the leadership of people like Robin, MIMA has helped create a unified community with a common goal of elevating the Twin Cities as a growth market for digital. Today, students are finding their way into careers in the Twin Cities, thanks in part to MIMA giving them the education, networking connections and job leads they need to find interesting work and stay in our region. We hope this year’s scholarship recipients—and all of our past recipients—will share their success with others and contribute to our growing digital marketing community. Students of any major are welcome to learn more and apply at http://mima.org/student-scholarship. I’m still riding high and feeling downright adventurous. 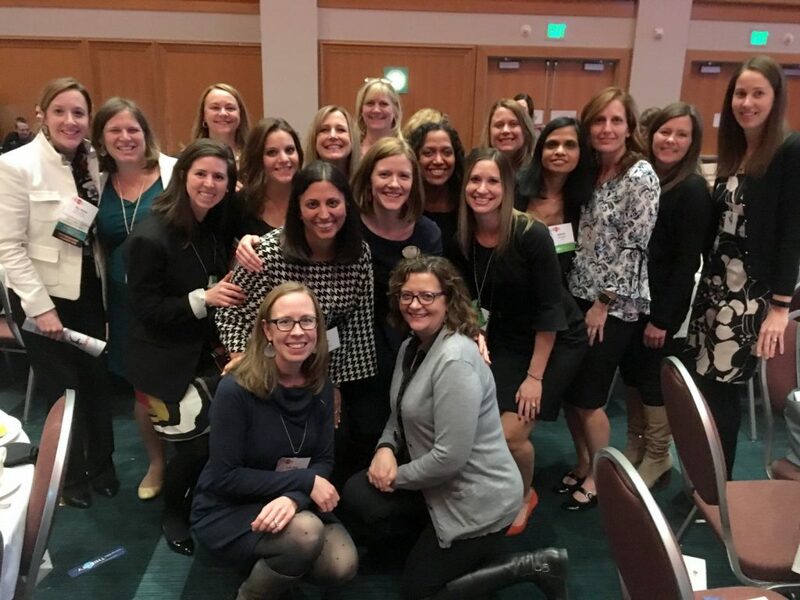 A few weeks ago, we rounded up two tables full of fabulous women colleagues, clients and friends and joined a crowd of nearly 900 attendees at the Women’s Health Leadership TRUST’s annual Forum event in downtown Minneapolis. The TRUST is one of the largest regional membership groups dedicated to supporting women leaders in health care and includes executives, clinicians, policymakers, business owners and leaders in adjacent industries. The theme for the evening was “courage,” which resonated loudly for me as an entrepreneur and small business owner. I was thrilled to finally have the chance to hear from a woman I’ve long followed and admired, arctic explorer Ann Bancroft. Ann did not disappoint, delivering a keynote speech that inspired us with stories of courageous adventure in the face of adversity. She also made us laugh along the way, reminding me of something I’ve long believed: it’s important to take your work, but not yourself, too seriously. It was a treat to be at the event. We share the TRUST’s vision for courageous leadership and have a long history of active involvement with the organization, since joining as members in 2005. Since then, we’ve had two board members—company founder Robin Carpenter and principal consultant Allison O’Connor—take active leadership roles in the TRUST. We’re the creators and sponsors of the annual TRUST Mentor of the Year Award (go ahead, nominate someone this year! ), and have twice facilitated the organization’s yearly strategic planning process. As part of our ongoing strategy of engaging with thought leaders in the industries we serve, Fathom is proud to be actively working with the TRUST to advance best practices and new ideas for the women who are guiding the future of the health care industry every day. Together, we can continue to blaze new trails in a field where change seems to be the only constant. User-Centered IoT: What’s in it for them? Similar to other product improvement projects, adding connectivity to a product must take into account how your customers will feel about the capabilities. Will they find it beneficial to be connected or, on the other hand, see it as intrusive? Expanding access points — Enhancing connectivity to allow customers to access services or products in new ways, including omni- and multi-channel experiences from a variety of connected devices. 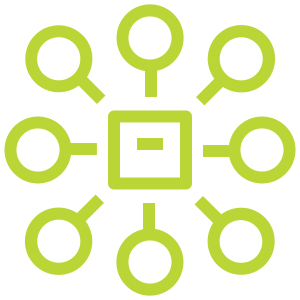 P roviding data to the user — Enhancing connectivity to provide data collected by a product back to the user of the product. In these cases, the hypothesis is that the data will provide some valuable insight to the user causing them to feel or act differently based on what they now know. 1. When customers view this data, what will they do differently because of it? Customers will find it unhelpful to receive data they can do nothing about. Performing research to put sample data in front of customers and find out what, if anything, would cause them to take action is key to making a good connected product. Additional testing can determine whether the insights are useful, easy-to-understand, and delivered at an appropriate frequency. Pay careful attention to providing users with insights too late to be useful. If a restaurant finds out their refrigerator was running too warm seven days after the food in it was already served to customers, they might be more frustrated than if they had never known at all. 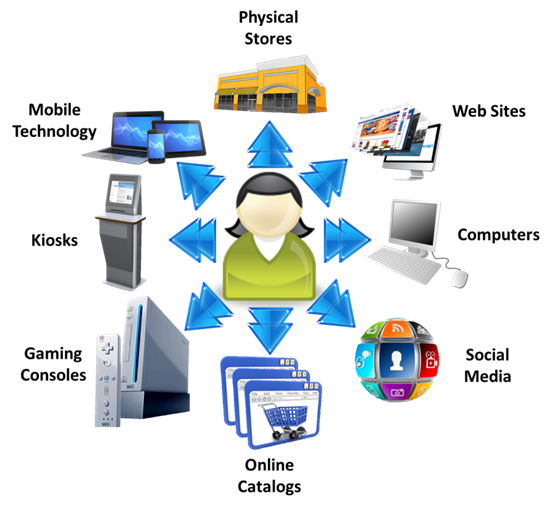 Also consider whether it would be beneficial for the product to take the next logical action for the customer. Rather than notifying a homeowner that their lights are on and nobody’s home, why not just shut them off? 2. What is the full picture of data that would need to exist to drive this action? Often, usage data alone may not provide adequate insight to trigger an action. But when combined with additional data from another source, the insight becomes clear and actionable. 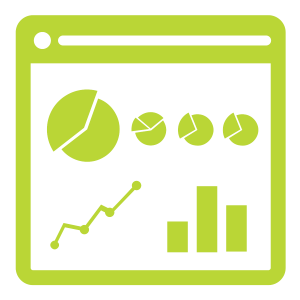 Find out from users what other relevant data is available to them, and how you could combine it with your data for maximum utility. For example, telling a surgeon only how many rubber gloves she used is just about as useful as telling her how many gallons of gas her car consumed. Without being able to see how this information correlates with the number of surgeries performed, your customers won’t be able to tell if their usage is appropriate or changing over time. 3. What is the best way for the user to receive the data? Most users will prefer to consume information in a place they are already going rather than bounce between several disparate systems. If they aren’t regularly accessing the product for data and insights now, it’s unlikely they will in the future (unless it is a very unique and compelling insight!). For example, many medical remote monitoring companies are now integrating device data with their customers’ existing electronic medical record software, rather than delivering it by bespoke hardware monitors or one-off web portals. 4. What are the user’s boundaries when it comes to data privacy? It’s important to understand where your users will draw the line about allowing a device to capture data about them. Even if the data can be used to provide a clear value, if seen as too invasive, adoption could be limited. Telling a marathoner how many miles she’s put on her shoes might be great, but if the data also reveals what time and exactly where she is running, she may feel it could put her in a potentially dangerous situation. 5. How does being connected change the service model? Users can help define if connected device experiences are additional touchpoints or replacement touchpoints. They can also point to ways that being connected could enhance or empower existing touchpoints. For example, field sales calls may remain a primary touchpoint, but sales reps could be provided with more tailored sales recommendations customized to the way the customer is using the product. Once the business objectives and user experience goals are thoroughly analyzed, there are some important things to consider about how the connections get built and implemented. None of the strategy and research methods we’ve covered so far are all that different from other product and service design efforts, but in our final installment we’ll cover four unique questions that we feel are critical for connectivity project teams to consider prior to implementation. If you’re interested in more information about user research with connectivity ideas, this post was also the basis for a recent presentation to TC UX Meetup. During a recent happy hour gathering of Fathom Consulting colleagues, a few of us realized a common thread running through several otherwise unrelated projects. It seemed that, all of a sudden, many of our clients had been bitten by the “connectivity” bug. Though diverse across industries, products, and services, many of our clients were actively exploring ways and reasons to allow their standalone products to communicate—to each other, to the cloud or data hub, and, in some cases, directly to users. Internet of Things (IoT) refers to the networking of physical things (often referred to as “smart devices”) in order to collect and exchange data. Some products we’ve worked with include medical devices, inventory control tags, and consumer goods. A simpler, but related, concept is that of “connected devices.” Connected devices send or receive data to at least one other device. They might use Internet protocols to make the exchange (making them part of the IoT), or they might just be connected directly to one other device (for example, a monitor on a patient that communicates via Bluetooth to a monitor across the room). These days the terms are used almost interchangeably. 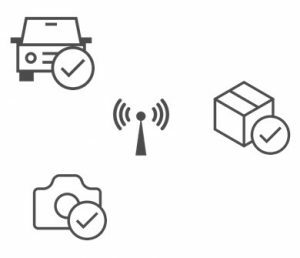 For these blog posts, we’re sticking with the broader label of “connected devices”—since most of the points we want to make are relevant whether or not the device is truly part of the IoT. Let’s start off with the obvious way that this latest technological capability is identical to all the others that came before it. Just like getting on the web in the late ‘90s and getting on social media 10 years ago was unwise unless you had a valid reason to do so, pursuing a connectivity solution just for the sake of it is just as likely to leave product owners feeling disappointed, foolish, and poor. Like all successful innovations, a move into a connected landscape must be underpinned by solid business and user objectives. We’ll explore three good business reasons to get connected in this post and user benefits in the next post. Traditionally, products that have shipped and are in the hands of users can be hard to maintain. The user has to do their own maintenance, and troubleshooting often involves frustrating phone calls to 1-800 numbers. But products that have shipped and are connected can more easily be maintained and repaired by a remote update. Rather than a service technician being deployed when things break down, fixes or version updates can be pushed to a user’s device via the Internet. The company saves time and money, and the user is back up and running much faster. Combine the ability to service products remotely with increased visibility into how the product is operating, and it may be possible to proactively solve a problem before the user is even aware there is one. Connectivity can not only prevent things from going wrong, but also make sure things go right. As an example, Tesla Motors recently pushed an update to its cars allowing drivers in Florida to drive more miles between battery charges as they evacuated prior to the arrival of Hurricane Irma. Even in cases in which a physical product must be fixed in person, the benefits of a company communicating with its products can still be realized. Data received from the device ahead of time could be used to diagnose the problem and ensure the dispatched technician has the correct tools, parts, and expertise to complete the job. When sitting down to discuss how a product could be improved or what features should make the cut-off for the next launch, we consistently counsel our clients to consider how their users use the product today. It makes more sense to spend design and development capital on important experiences that a re frequently used or difficult rather than upgrading features that no one knows exist. Yet often our clients have to make educated guesses or spend time on baseline research just to understand what, exactly, their customers are doing with their products. But when products in the field are connected and communicating usage data, suddenly insights about problem areas or underutilized features are readily available. These insights can inform product design and feature lists in a way analogous to web analytics. When combined with additional information the device might collect on the location, time, and the user’s identity, this data can even serve as the foundation of a robust persona or inform an audience-specific design process. In addition, usage information could empower others at the company who interface with the user. Perhaps a certain user needs additional training on advanced features or is operating the product in an unethical or inefficient way that should be addressed. If the inventory of consumable products can be captured and transmitted, then sales calls or promotions could be expertly timed. The ability to provide more options for serving and charging your customers increases exponentially once a physical product is connecting in real time. Rather than a monthly service fee, customers could pay for each time or day they use the product. These options could be attractive to customers who otherwise would not have purchased the product, believing that they wouldn’t use it enough to justify the subscription fees (similar to the pay-as-you-go mobile phones). Leasing models on connected products could now include low, medium, or high-usage plans, or advanced features could be immediately enabled after payment of an upgrade cost—akin to web apps like Google Drive or SurveyMonkey. This gives the makers of physical products new ways to get their foot in the door with customers at a lower price point. Costly medical monitoring equipment or seldom-used safety equipment could follow the path of tiered pricing models set out by digital-only companies like Hulu, or sell packages of concurrent users like Adobe. Instead of connecting with customers a few times a year via in-person visits or phone calls, you could have literally hundreds of small touchpoints with them each month as they interact with you via the product. This could drastically change the closeness of the service relationship, while saving the business money on a costly field sales and service team. These benefits to the business may be reason enough for many organizations to see the value in getting connected. Basic back-of-the-napkin math on increased sales or savings from more efficient service is often enough to justify the investment in getting connected. But remember—we’ve only covered the internal benefits here! Next time we’ll explore how to create connected solutions users will love, too. You have communicated the change at every opportunity—and heads were nodding at every meeting. You start the implementation, and then suddenly progress stalls. Deadlines are not met. The excitement for the change starts to wane. “What did I do wrong?” you ask yourself. You read the right books, you followed all of the steps; this should be working! In order to implement change, the forces for change must be greater than the resistance to it. Resistance to change takes many forms, but we at Fathom Consulting see our clients struggle over and over again when people simply will not adopt the new processes or tools. “Why am I doing all this new work?” they might ask. Or, they might dismiss all the reasons the change is needed because they question your credibility. These people are the hold-outs. They see “your” changes as a waste of “their” time. As a leader, you might think you can pull rank and just “make” them do it. But even when these individuals are in your chain of command (which is not a given), competing organizational priorities, their strong relationships with internal or external customers, and their specialized knowledge could mean your ability to exert formal authority over the hold-outs is not guaranteed. What do you do? How do you bring these people along? Or, even better, how do you head off this problem in the first place? Once you have identified the group of potential hold-outs, identify your approach to working with them to meet project goals. What does persuading your potential hold-outs entail? There are numerous books on the subject, but I often find myself relying on techniques that—surprisingly—I learned in acting school. Two concepts I learned that I still apply are objectives and actions. Objectives. Characters in plays, like organizational leaders, have objectives. Romeo’s objective is to marry Juliet. 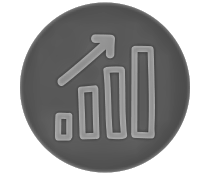 Your objective is to implement a new organization, set of tools, or processes. Actions. Actions are the series of tactics a character uses to reach their objective. Actions, which are expressed as verbs, give actors something to do with their lines beyond just saying them. In the Harry Potter movies, the great British actor Ralph Fiennes plays Lord Voldemort, the evil lord bent on conquering the wizarding world. Voldemort is so compelling because Fiennes employs so many interesting tactics in pursuit of his goal. In the hands of a lesser actor, Voldemort’s actions would simply be: “scare (people)”; “scare (people)”; “scare (people)”; “attack (Harry Potter).” Instead, Fiennes uses a variety of actions. He praises, soothes, welcomes, commands, wonders, calculates, tempts, crushes, treasures, menaces, honors, and so on. And then he attacks Harry Potter! Listen: What are their concerns, fears, and frustrations? Explain: Do they understand the business reasons for the change, and how it benefits them? Empathize: Do they just need an opportunity to be heard? Collaborate: If they help develop the solution, will they align with the project’s goals? Problem-solve: Their resistance may be rooted in having to do new and additional work. Are there ways to reduce their workload or solve other problems they might have? Amuse: Can you build a better relationship with the hold-outs through humor, lessening resistance? Challenge: If someone is holding out, but others are adapting to the change, how does your hold-out explain that? What is their core issue? Hand hold: Check in frequently. Is their resistance softening? If not, repeat the above steps! Notice that the verb escalate is not on the list, although that is often the first thing we think of. “If Joe isn’t going to get on board, I am going to go to his boss to make him!” Escalation is necessary at times, but try to work out differences as best you can without escalating. When you are successful at working through resistance without escalation, you will build stronger relationships—not weaken the ones you have. The final step is to persevere. The importance of perseverance and follow-through cannot be overstated. If you stop trying, you will likely move backward—not forward. Based on years of experience at Fathom Consulting, we are confident you will need to spend more time with potential hold outs than you expect. You cannot count on the normal chain of command to communicate change to prevent hold-outs. Our experience is that companies underestimate this work and may not stick with it. Your change is likely to be less successful if you fall into this trap. Change is hard, and leading change is harder. But change is inevitable. Nearly every client with whom we partner is undertaking transformational work driven by the need to expand markets, respond to new regulations, leverage new technology, adjust to new demographics, or address new competitive threats. Executing a well-designed change management plan is critical to achieve these transformations, but the plan has to take into account potential hold-outs. Bringing these people along is going to take more than a direction, more than a meeting, more than training. It is going to take action.